I'd like to thank The Foodie Mommy for this award. Check out her blog. It's a blog about cooking healthy foods with fresh ingredients. She tells you things like how to make brownies with spinach. That's right. Brownies. with Spinach! Crazy! In addition to recipes she has tips and videos and giveaways. Go check it out! As a part of accepting this award, I'm supposed to come up with my blogging philosophy in 5 words. I'm a newbie blogger so I haven't thought about things like philosophies but thanks for helping me work on that. I guess I pick #3. 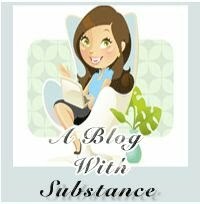 As part of this award (and this is the fun part), I get to give 10 other bloggers A Blog With Substance Award. Thanks you to all of the bloggers who have welcomed me into your blogging community!! Oh, and if you don't mind, may I ask you about reading stuff later on (for my little girl)?? It's 2am here so... I gotta hit the sack or my hubz will kill me. Thank you so much for mentioning my blog! I absolutely agree to reading to your baby everyday, I've done it with my daughter and I can't believe how much she has learned from it while at the same time just hanging out with mom! Congratulations on your award and on an awesome start to a great blog! Thanks for passing this award on to me. Made my day! Congrats! This is such a cute blog!